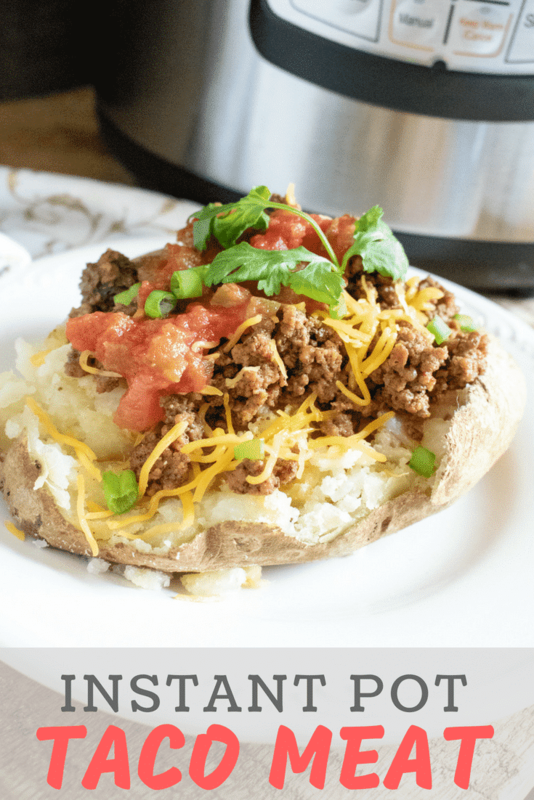 You are here: Home / Main dishes / Instant Pot Taco Meat Recipe — Spice Up Taco Tuesday! Is Taco Tuesday a standard in your home, like it is at mine? Tacos are delicious, don’t get me wrong, but it can get boring using the same old fillings again and again. Luckily, it’s easy to spice things up with this delicious Instant Pot Taco Meat recipe! 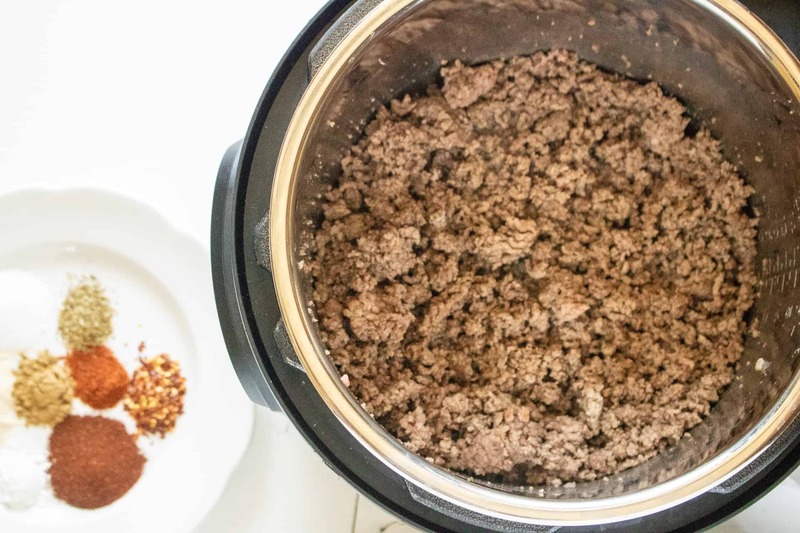 Thanks to the zesty flavors of onion powder, chili powder, cumin, red pepper flakes, dried oregano and cayenne pepper, Instant Pot Taco Meat will become your new go-to taco meat recipe! 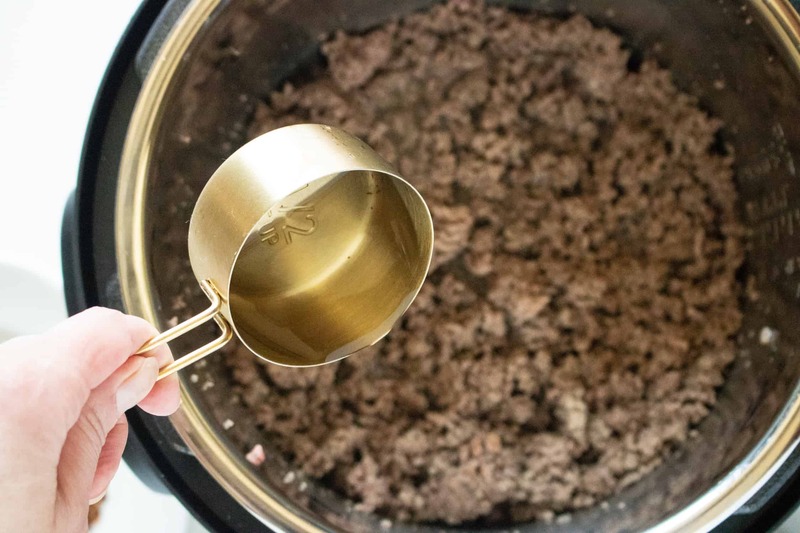 Since it’s cooked in my absolute favorite kitchen gadget, the Instant Pot, the meat stays moist and doesn’t dry out or get over cooked like it sometimes does when you brown it on the stove. And, this recipe is so quick and easy to make; simplu brown the meat in the Instant Pot, add in the seasonings, set it, and walk away. Start to finish, it’s ready in just 20 minutes! 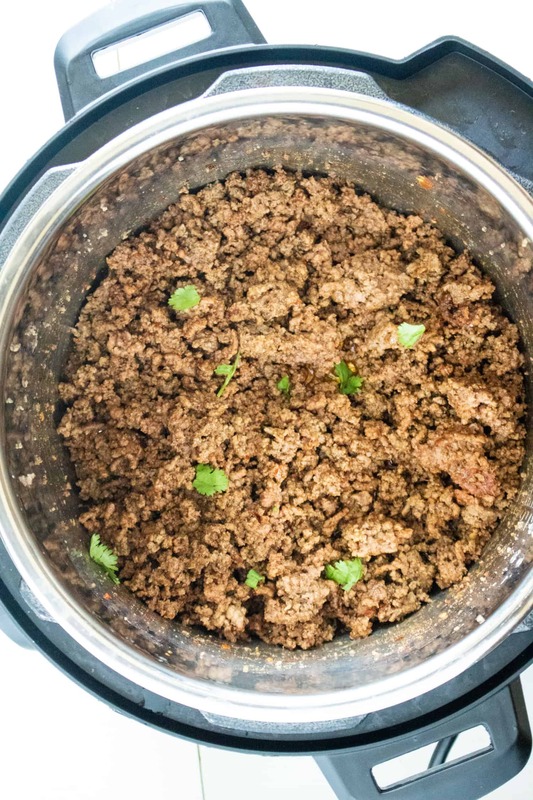 Is Instant Pot Taco Meat Good For You? Yes! One serving of this taco meat has 110 calories, 2.7 grams of fat, 1.6 grams of carbs and 18.9 grams of protein. Plus, this recipe is so versatile! You can easily adjust the flavors and spices to suit your personal preferences and make it even more scrumptious. If you’ve got leftover taco meat you can store it in the fridge for 2-3 days. It will also keep for up to 3 months in your freezer. For the quintessential Taco Tuesday meal, you’ve got to include the traditional sides of rice and beans. Copycat Chipotle Cilantro Rice is one of my absolute favorites, because it’s full of fresh cilantro and lime flavors! And, this recipe for Instant Pot Refried Beans is not only so easy to make, it’s also healthy and delicious. 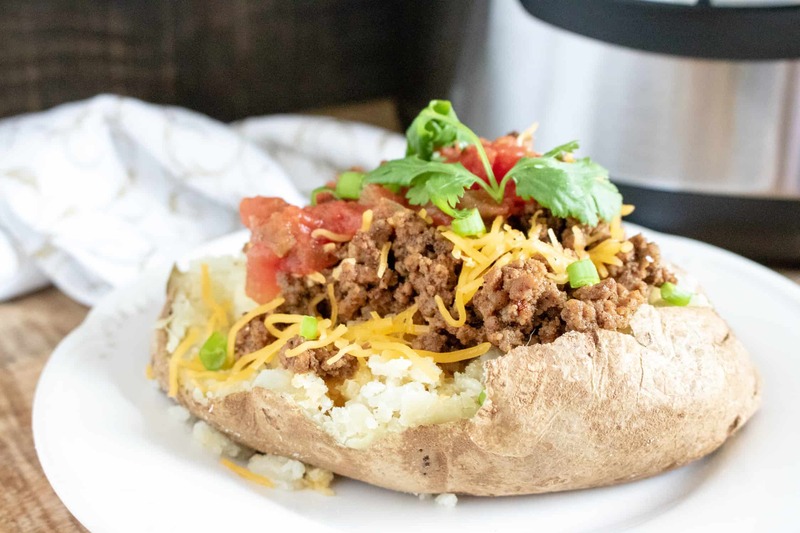 Or, for something a bit different, why not think outside the taco shell and serve this Instant Pot Taco Meat over Baked Potatoes! If you haven’t tried this before, it just might become you new favorite! Step #1: Using the sauté mode, brown ground beef in the Instant Pot. Drain the grease, and then add the remaining ingredients. Step #2: Next, close the lid on the pressure cooker and turn the valve to sealing position. Step #3: Set to a manual high time for 10 minutes. When the cooking time has finished, do a quick release. Step #4: Remove the lid and then serve! 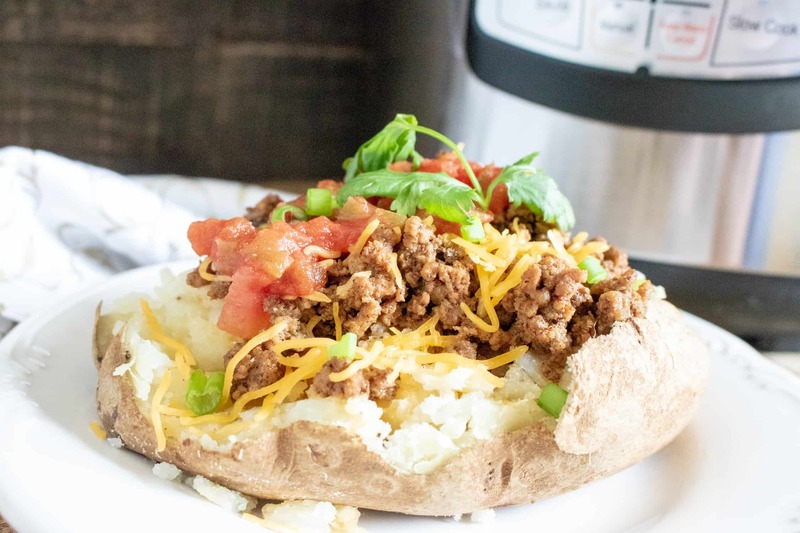 Spice up Taco Tuesday with this quick, easy and delicious Instant Pot Taco Meat Recipe! Using sauté mode, brown ground beef in the Instant Pot. Drain grease and then add the remaining ingredients.